Hello, Karen here and I am back to share my Week 16 pages with you! 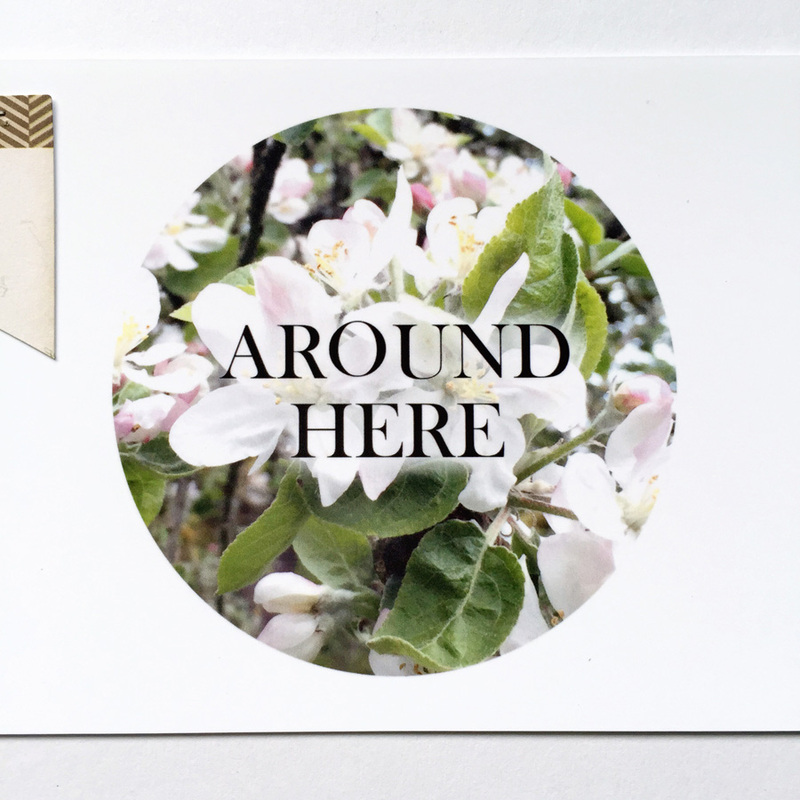 This week I features the new digital stamps from the Around Here | Mini Pack Collection. These PNG files are perfect to add some LOVE DAY SEED flare directly onto your photos. 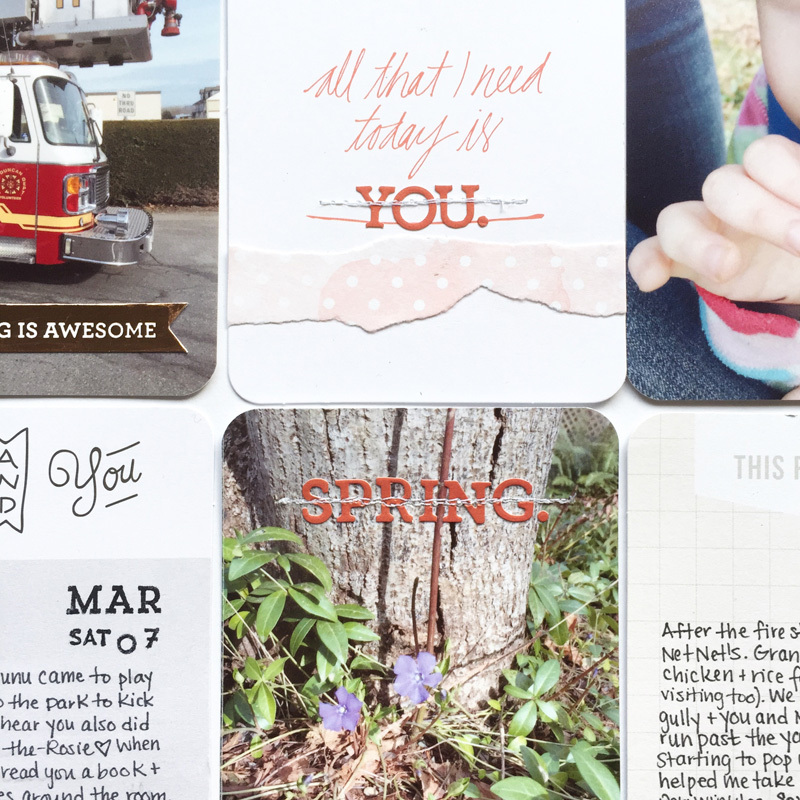 Of course these designs are also available in the 3×4 and 4×6 printables as well. I’m loving the options and embracing the opportunity to do some hybrid scrapping! Another notable thing about this week’s pages is that I had a lot of moments to document and I couldn’t contain them all to my usual two 12×12 pages. 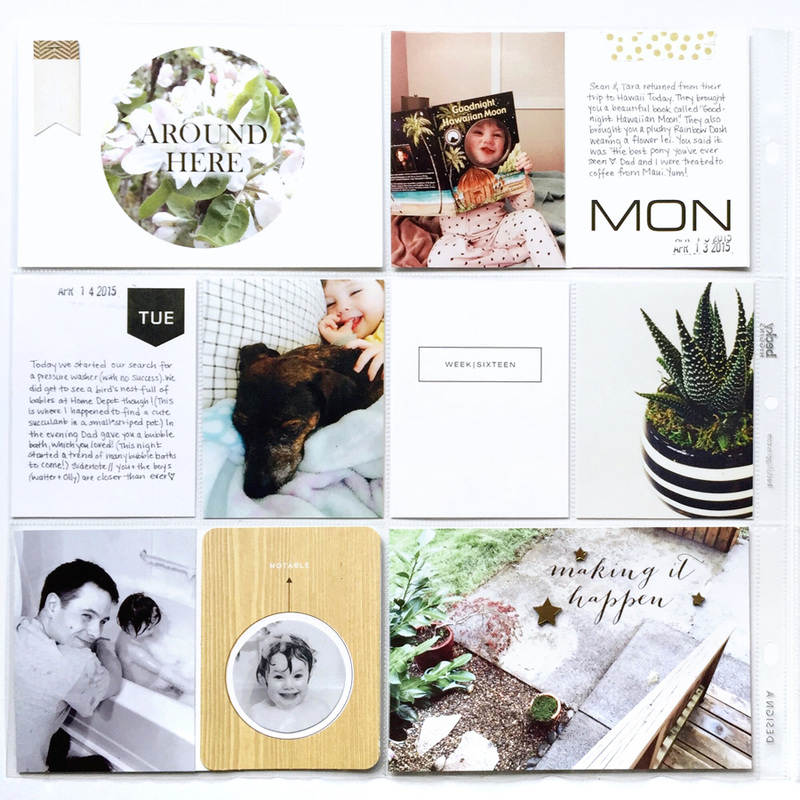 To solve this issue I simply added in some additional pockets in the form of a 6×12 insert (my regular Becky Higgins Design A cut in half). 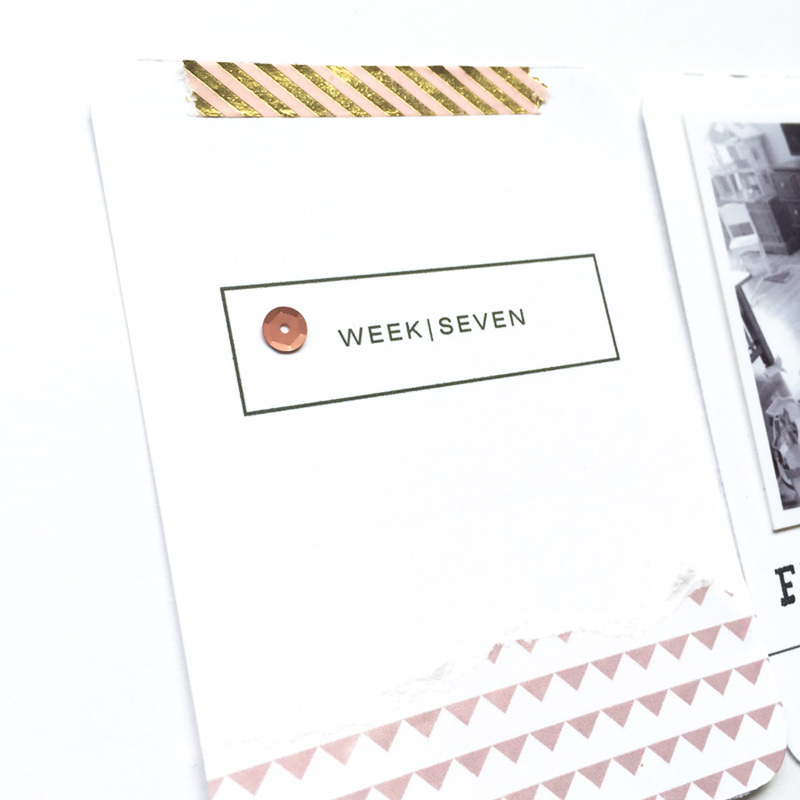 There was a lot of journaling to include and to keep a consistent look I chose to use a few variations from the Week Days | Calendar Collection. I just loved how these days-of-the-week designs look scattered throughout the pages. 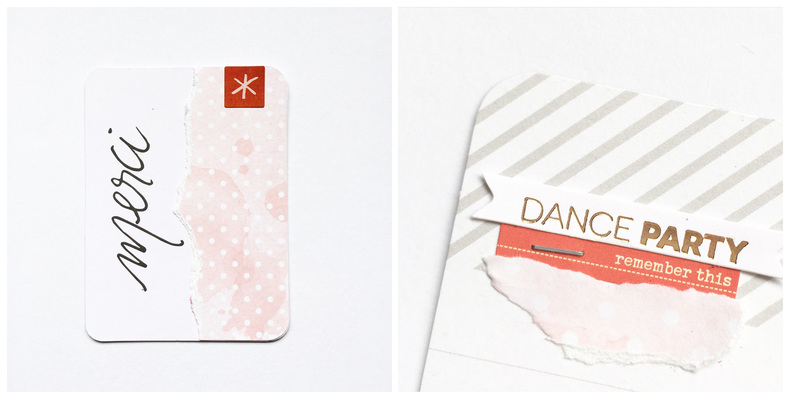 I tied everything together with a few embellishments and a gold polka dot washi tape. 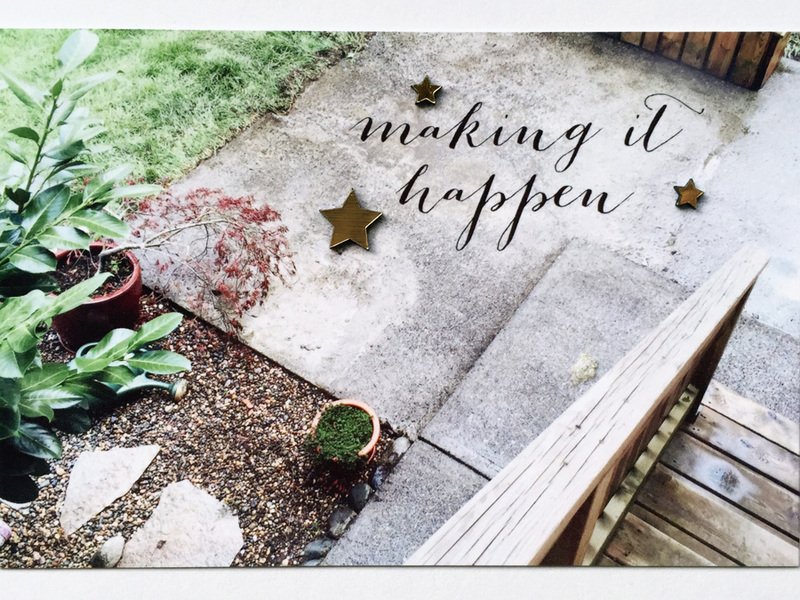 I really hope you have enjoyed checking out my pages and I look forward to sharing more inspiration soon! (Please see the bottom of this post for a complete list of supplies). Hi everyone! Karen here and I am so excited to show you guys my latest pages. 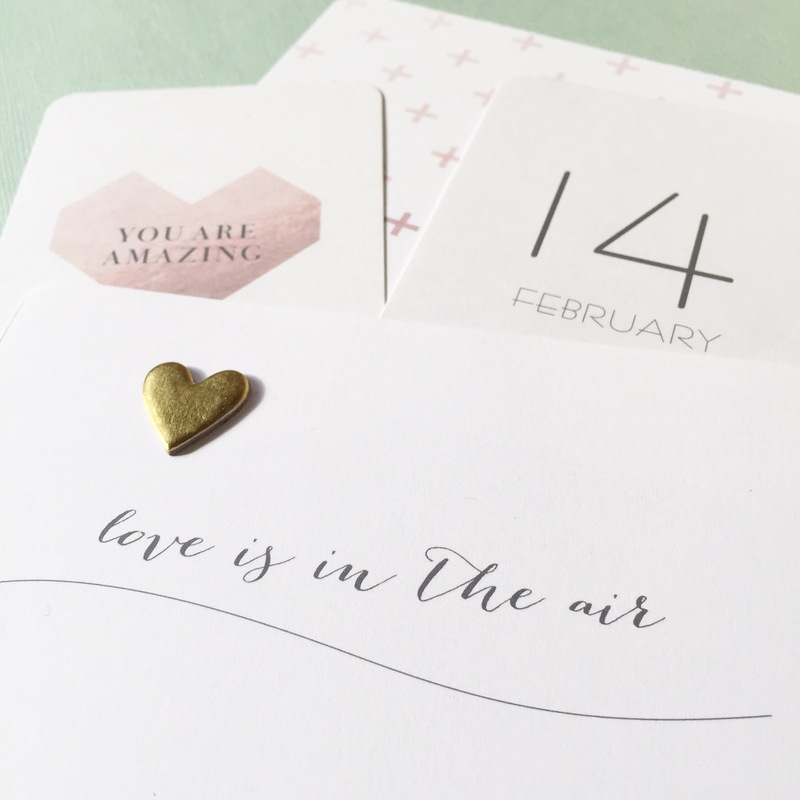 In this post I share with you how I used the clean, minimalist designs of the Love Day Seed products to compliment a collection of embellishments I haven been wanting to bust out of my stash (BasicGrey – RSVP). I also share a few ideas on how you can add more content to your pages by using flip pockets and QR codes. Let’s dive in! This day was so jammed packed full of excitement that I couldn’t contain it to my usual 2-page 12×12 spread. 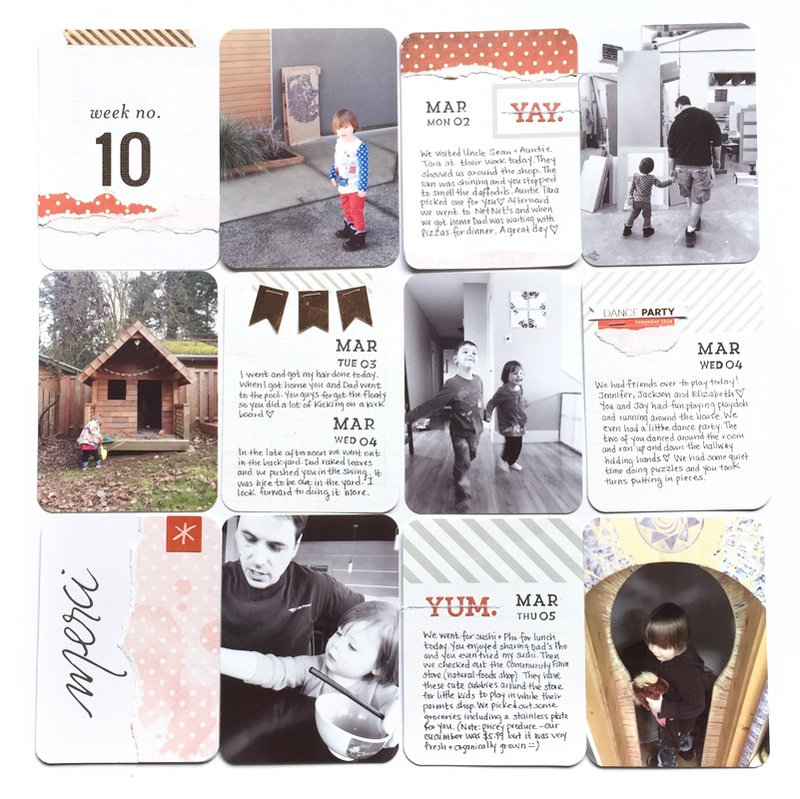 In order to include more photos and journaling I used a handy product from Simple Stories called Photo Flip Pockets. 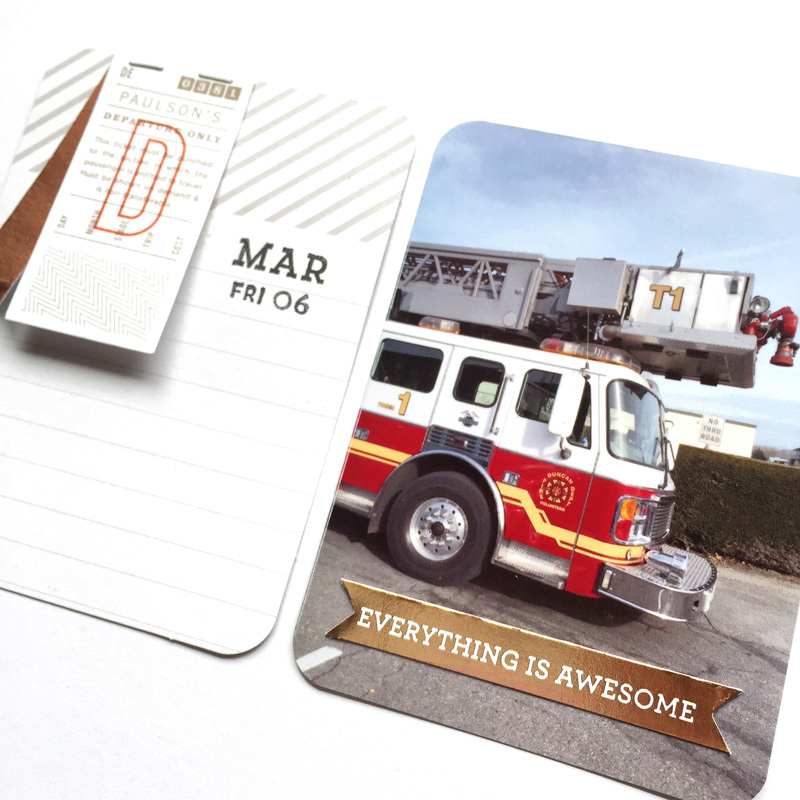 These little beauties attach to your page protector and add additional 3×4 or 4×6 pockets. Page one of my spread got two of the 4×6 pockets.Of course I had to use the big giant “3” from the Calendar Numbers pack – it was just too perfect. 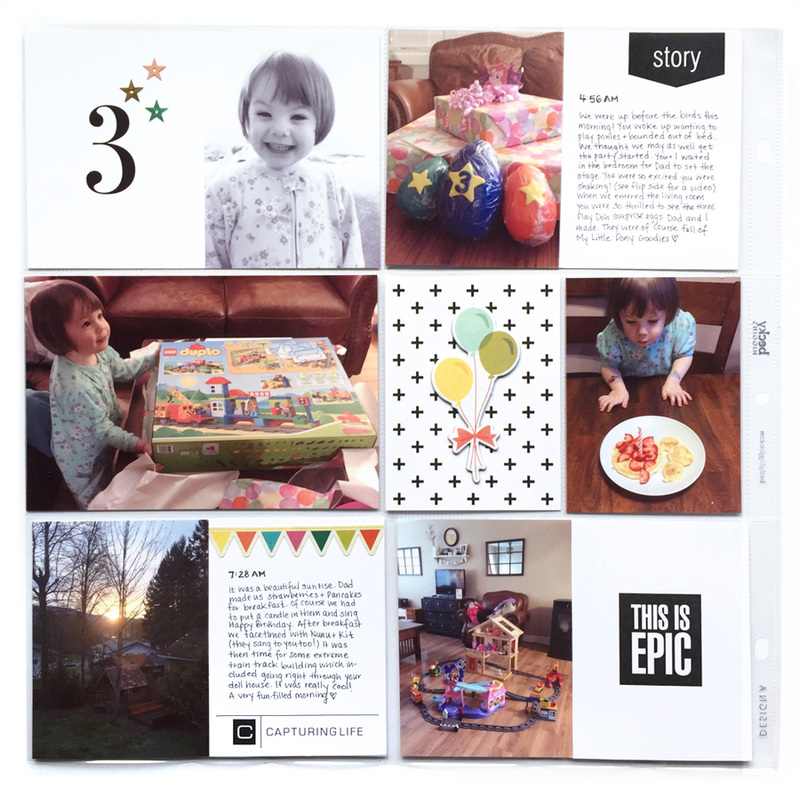 The 4×6 “story” journaling card (Journal Titles pack) tells the tale of our early morning and the extreme excitement that beamed from our little girl. 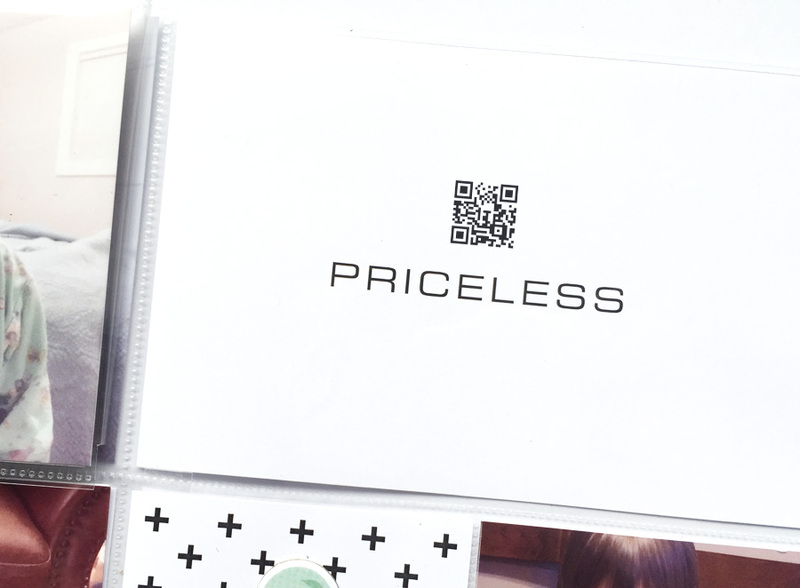 When you flip the added pocket over you will find a QR code that I printed directly on the “priceless” design from the Single Word theme pack. For those of you who may not be familiar with QR codes, they are simply a link in barcode form that can be scanned with a smart phone app (click here to see how you can create your own code). This particular QR code when scanned will take you to a video on YouTube showing just how excited our little one was! (You can check out the video here). 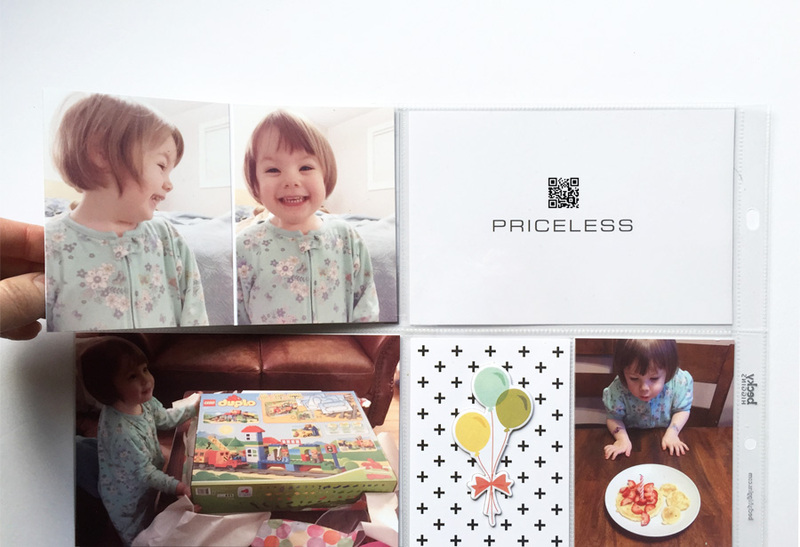 Another flip pocket was used on the second row of pictures. 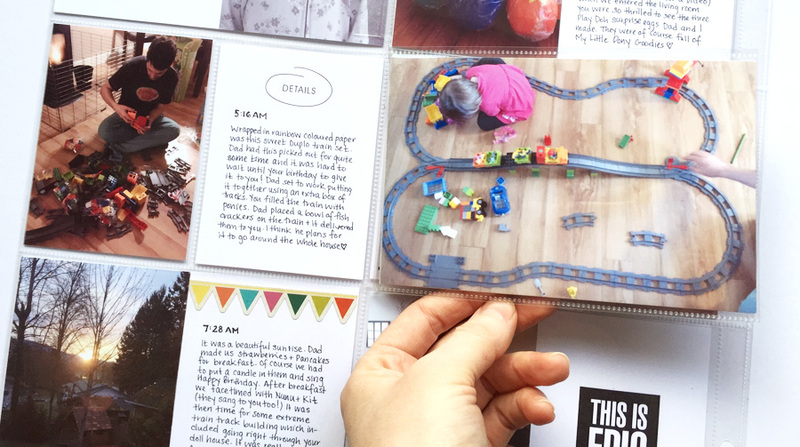 This one reveals Dad hard at work building her new train set – the “details” card from the Simple Journal pack tells the story. 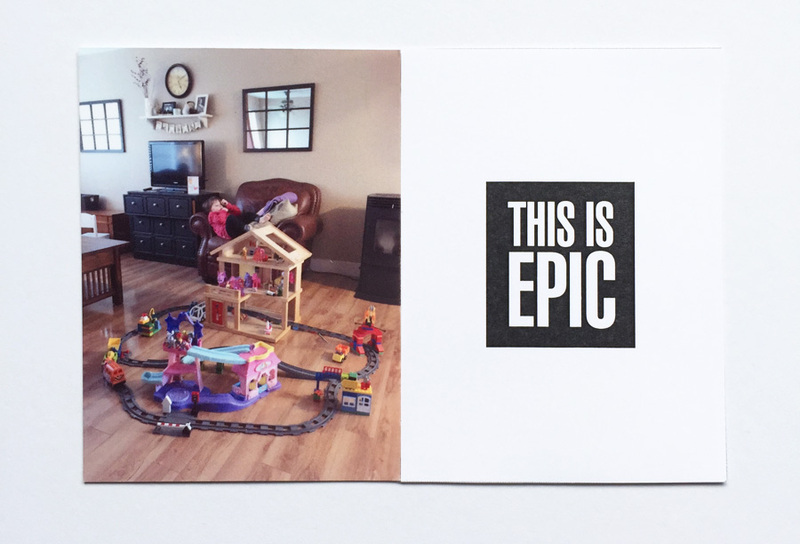 I filled up the “capturing life” card (Simple Journal pack) with journaling and used the “this is epic” card (Sentiments theme pack) to highlight the amazing train track my hubby and daughter built (the train went right through the doll house – that is pretty epic if you ask me!). 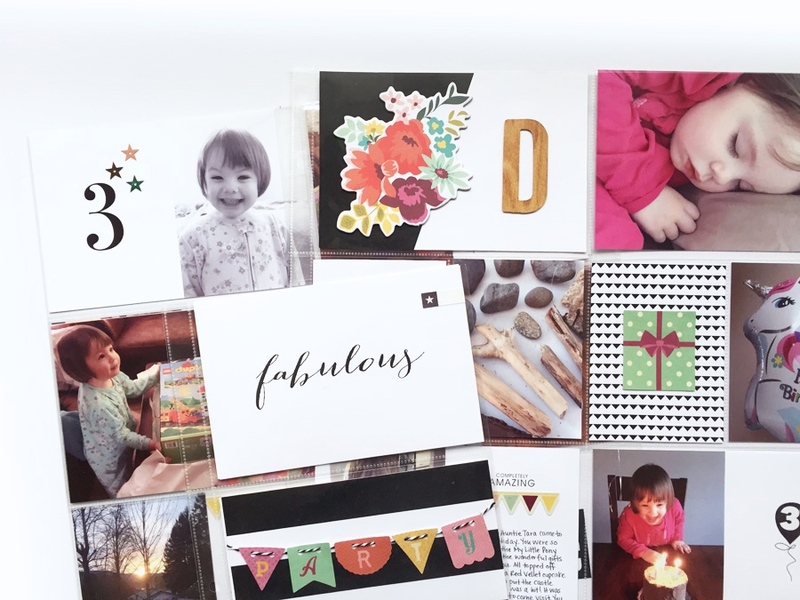 Page two starts off with this stunning blocked pattern design (Black and White Pattern pack) which is perfect from showcasing this huge chipboard embellishment that I have been hoarding. 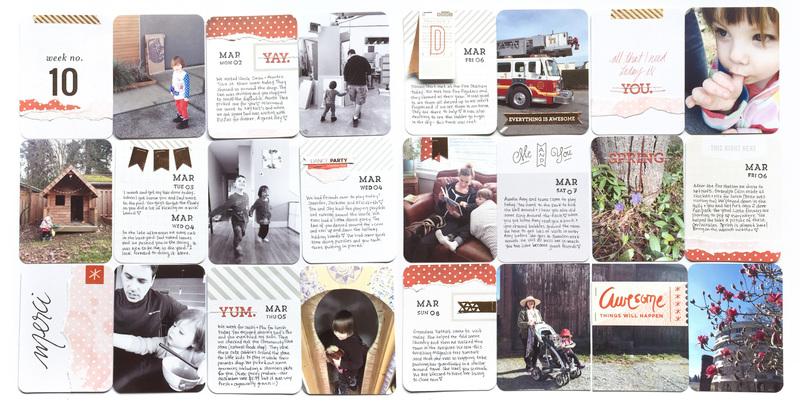 The story of the day continues with journaling cards from the Simple Journal pack (one of my fave packs!). 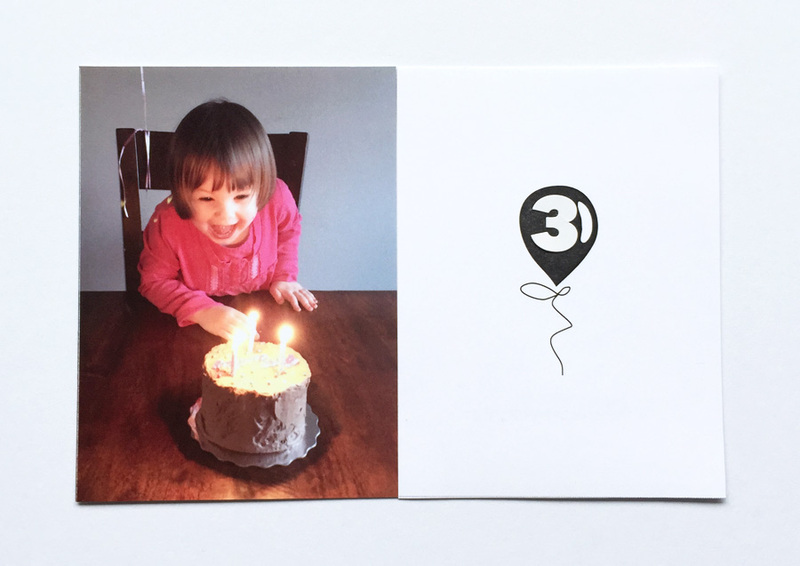 And of course I couldn’t do a birthday layout without using the cute little balloon card from the Sentiments pack embellished with a little “3” sticker. And you think I would be done there, but there is more! I added in a 6×8 page right in the middle. One side is a bit of a title page and I using the lovely script “fabulous” (Single Word theme pack) combined with a the bold stripes from the Black and White Pattern pack. 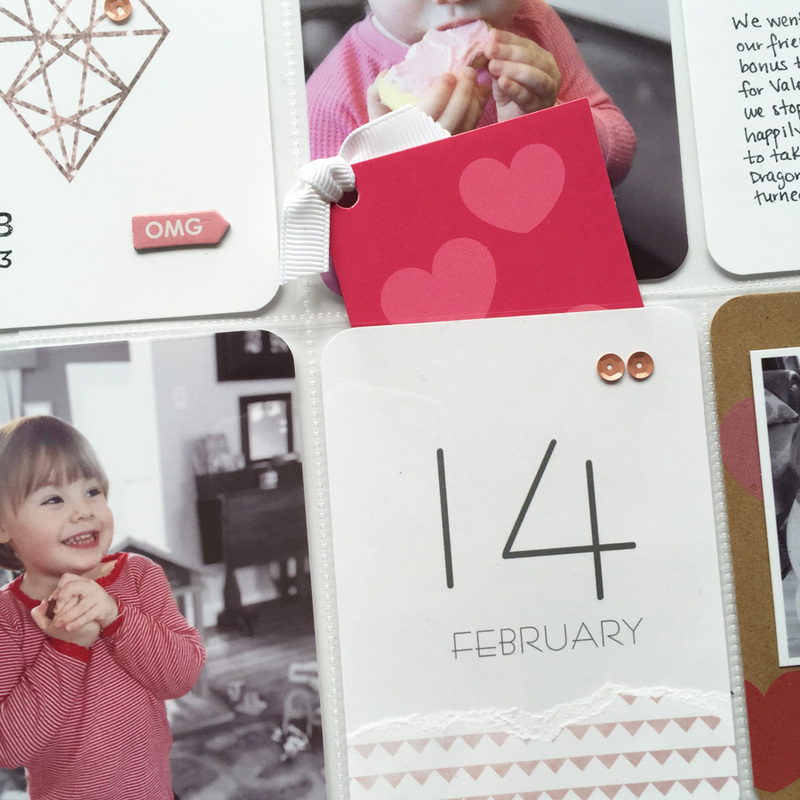 The flip side holds images of her little birthday cake as well as one of my favourite images from this layout showing my little girl at age 1, 2 and 3! 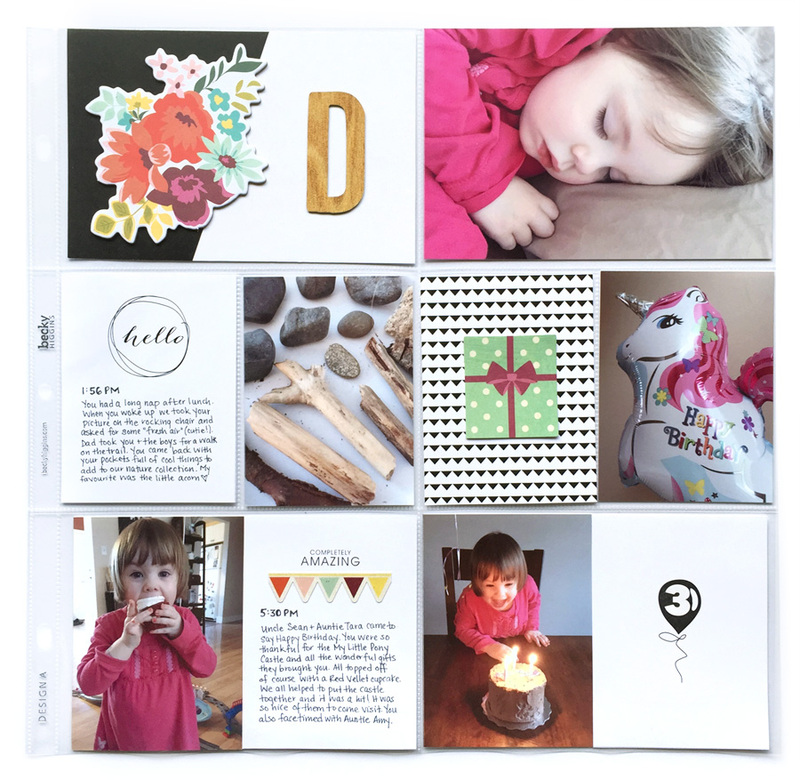 It was truly a pleasure to document my darling’s birthday with these beautiful designs. 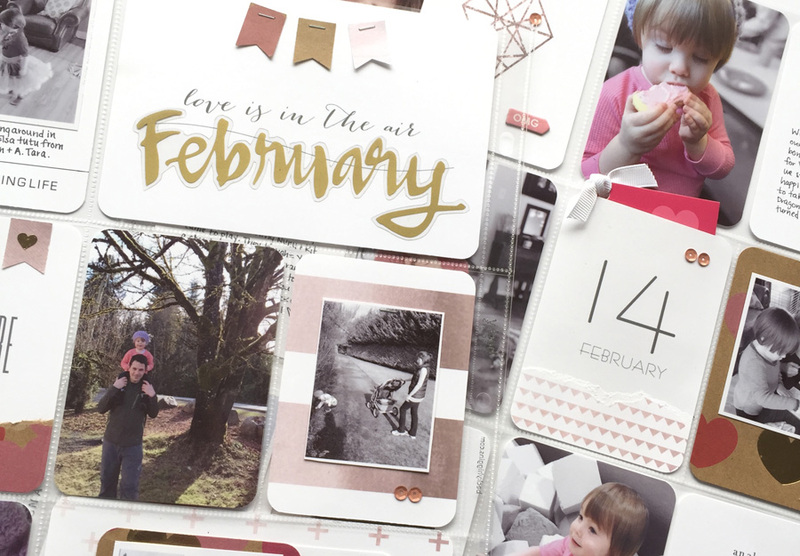 I hope I have inspired you dig into your stash and pair up some of your favourite embellishments with some Love Day Seed designs. And don’t forget you can add in your extra tidbits with flip pockets and QR codes. Until next time, happy crafting! Week 10 is in the books! 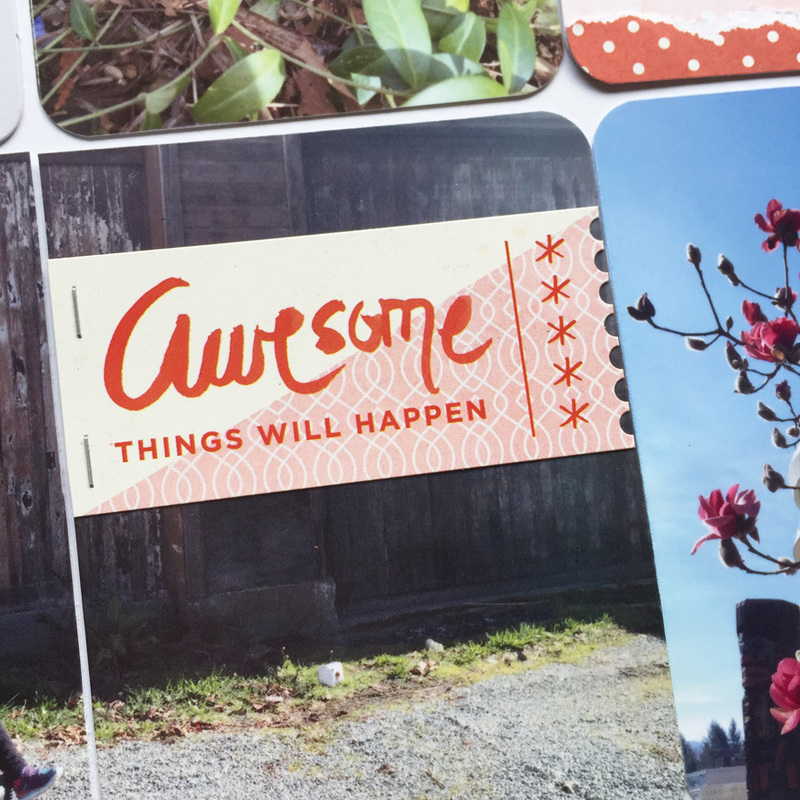 It feels great to be back in my craft room working on my Project Life spreads. I took some time off to organize my craft space and make it to a more functional. One of the areas I tackled was my embellishment drawer(s). Since I usually scrap by colour, I realized that I could probably be more productive if I organized my supplies in this way as well. Week 10 was my first layout using this new system and I loved it. I found myself using embellishments that I have had and loved for a long time but forgotten about. More to come on this new colour organization stuff soon! I hope you enjoy taking a look at my Week 10 pages and keep reading to see a complete list of supplies. 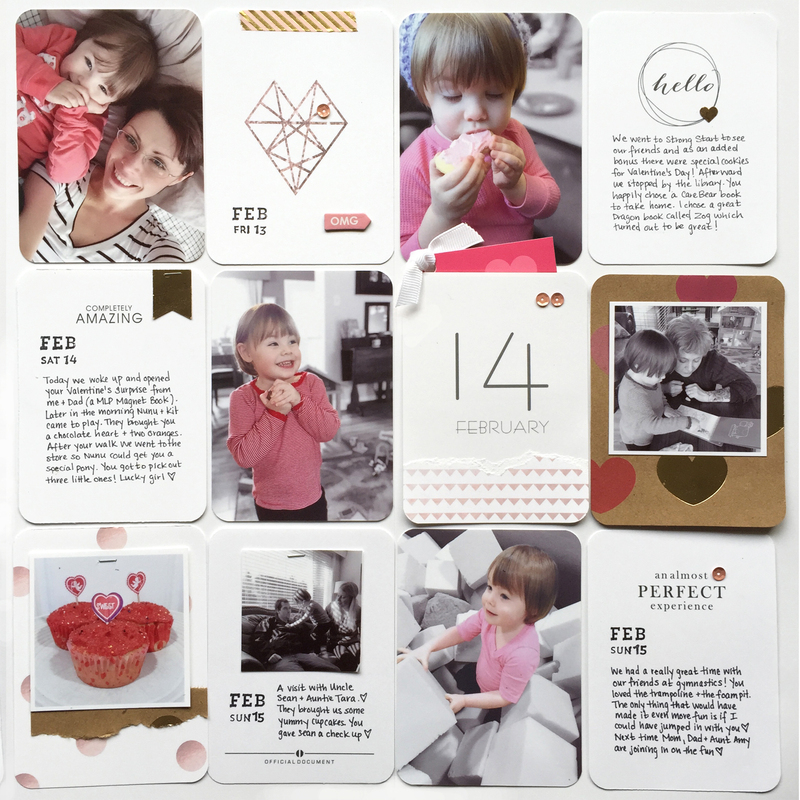 A torn pink polka dot card (Project Life Neapolitan Core Kit) adds texture and interest. 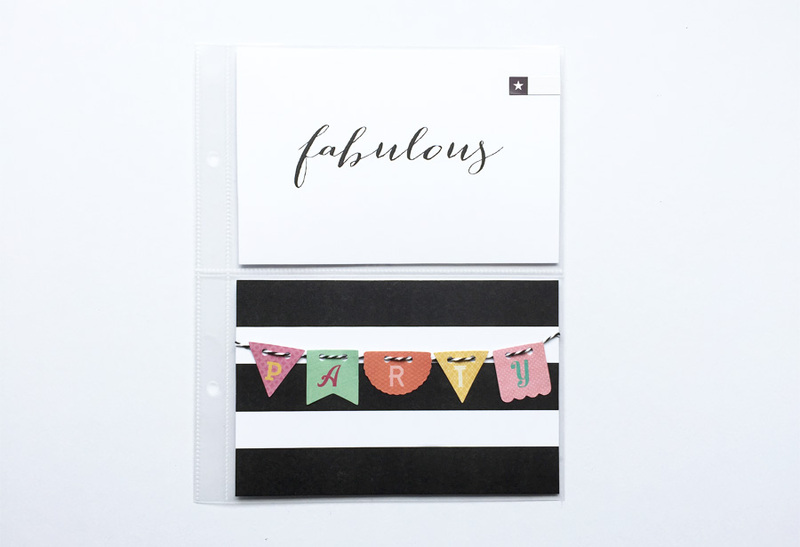 These gorgeous gold foil banners (Studio Calico Project Life subscription) are sprinkled throughout. Loving the texture that the machine stitches add (they also keep these letter stickers in place). I hope you enjoyed checking out my Week 10 pages. 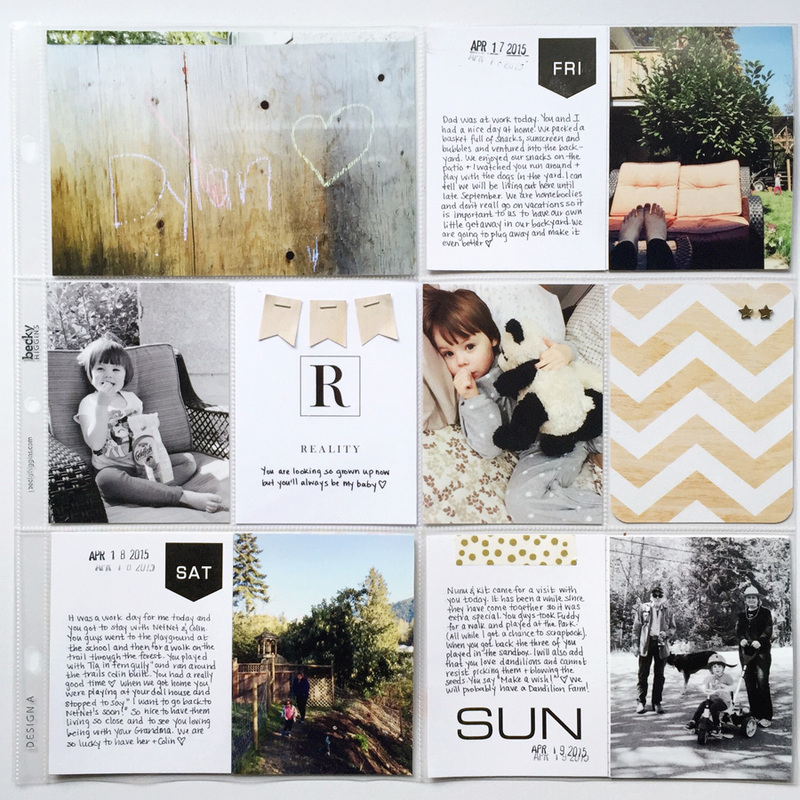 Please follow me on Instagram for more pocket scrapbooking inspiration. Happy Scrapping! Hello! 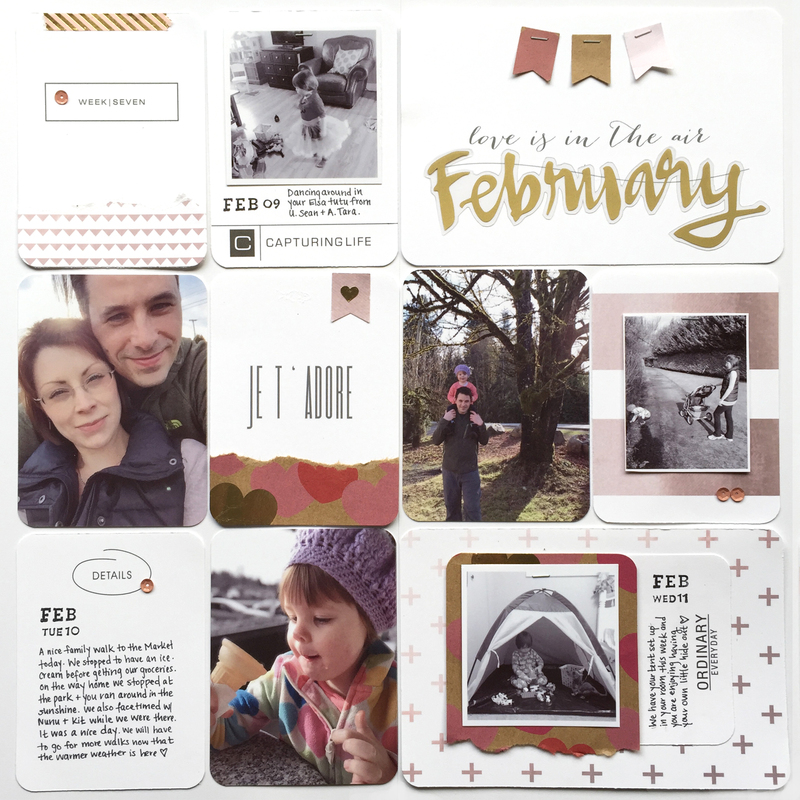 Today I am excited to be sharing my week seven pocket-page spread using some beautiful cards from Love Day Seed. 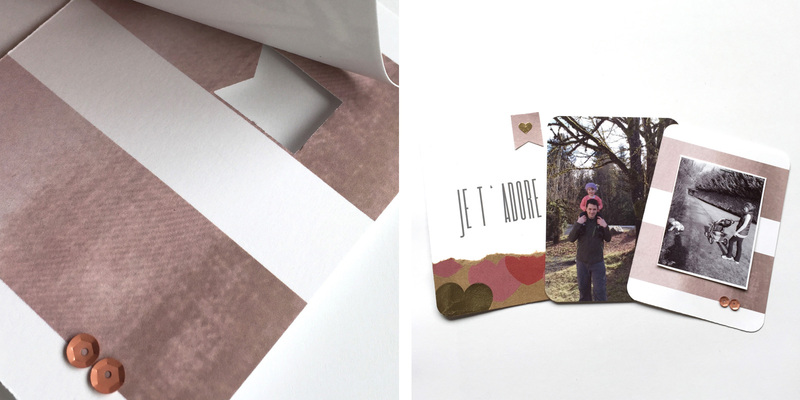 My heart melted for the new rose gold TRULY collection and the accompanying TRULY GIFT (if you haven’t picked up Valentine’s Freebie yet be sure to head on over to the LDS shop > Gold Collection). Lets take a look at the first side of this two-page spread. 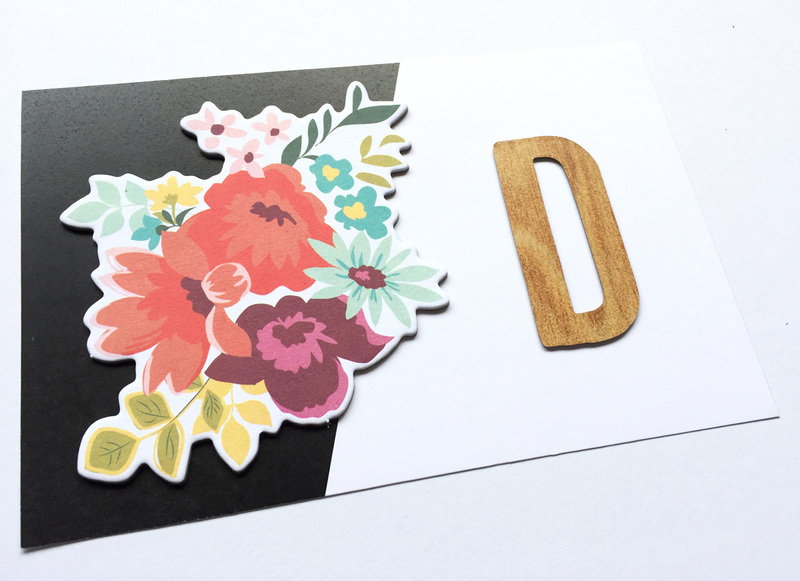 One of my favourite things to do lately is to add some texture to my cards with ripped patterned paper. (I was inspired to do this by RetroHipMama). Take this weekly title card for example (White Collection | Calendar | Weekly Frames). I added some texture and a little bit of colour with pieces from this lovely rose gold triangle card (Gold Collection | Texture Pattern | Rose). 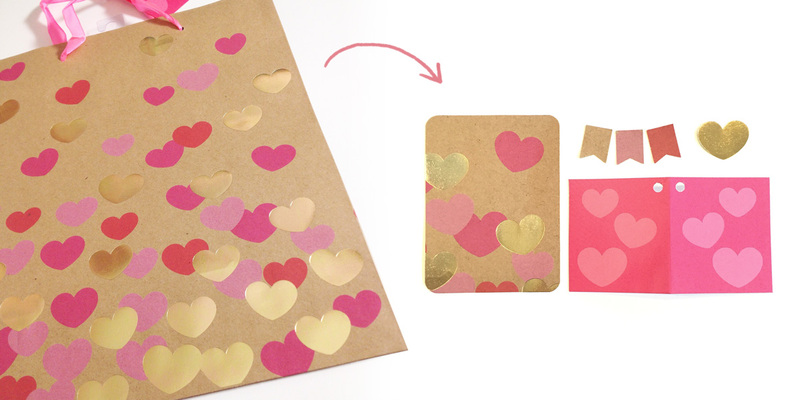 I kept the embellishing pretty minimal with a small rose gold sequin and little strip of pink and gold washi. 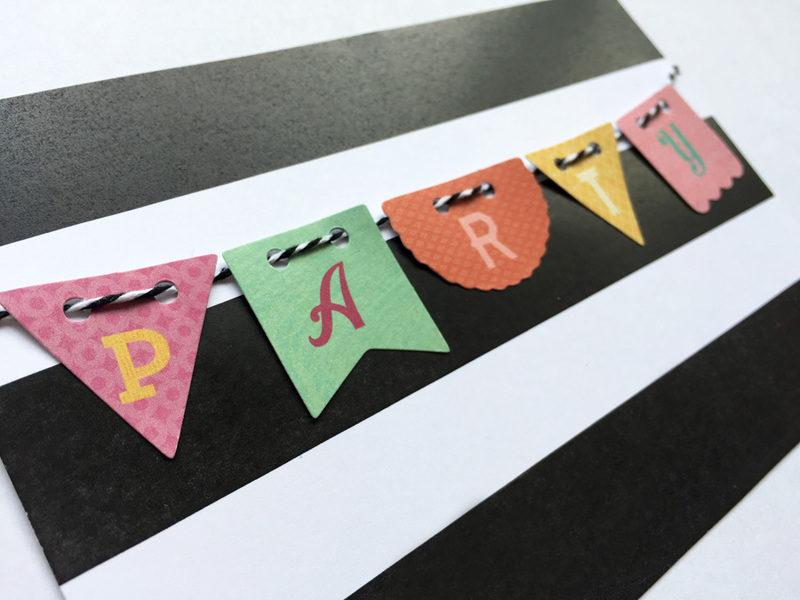 Another simple and minimalist embellishment that I love to add is a small paper banner shape using one of my paper punches. One of my favourite things to do is sneak a bit of paper from another card on the page, like I did with this striped rose gold card (Gold Collection | Texture Pattern | Rose). No one will ever know that there is a piece of the card missing because the hole is covered by my photo. 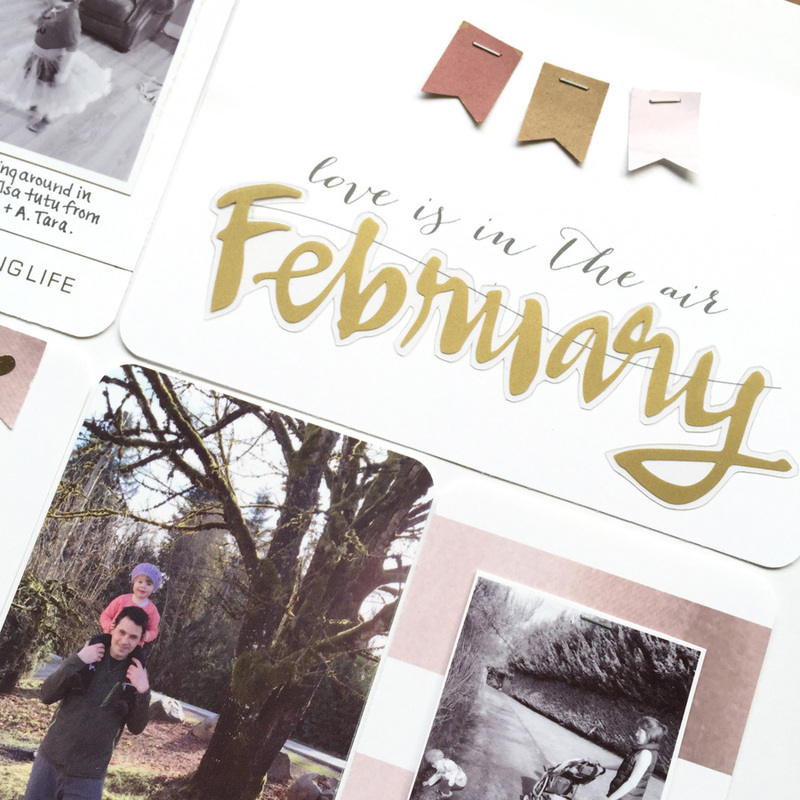 I also used my paper punched banners to add a little bit of whimsy to this card from the TRULY gift pack and topped it off with the “February” gold transparency from Studio Calico. And here is a look at the right side of this two-page layout. If you follow me on Instagram you may have noted that I challenged myself to use a dollar store gift bag to embellish my pages documenting Valentine’s day. 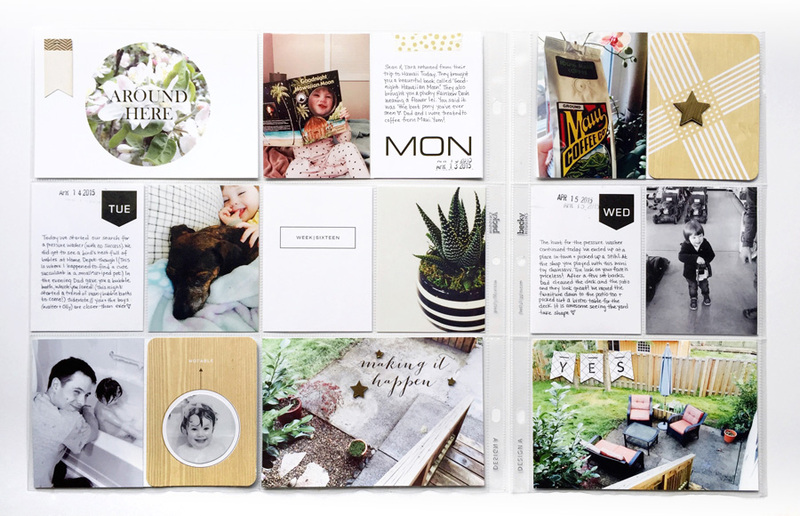 Here are a few ways that I used this gold foiled krafty goodness with the clean designs of these journaling cards from the White Collection. I managed to find a way to sneak in a love-note using the little card that came attached to the gift bag. 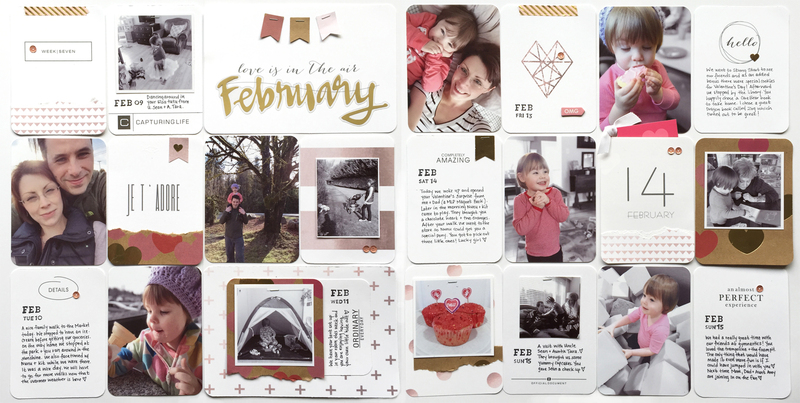 I tucked it in behind this February 14 filler card (Gold Collection | Truly Gift). And finally, here is a look at the full two page spread! 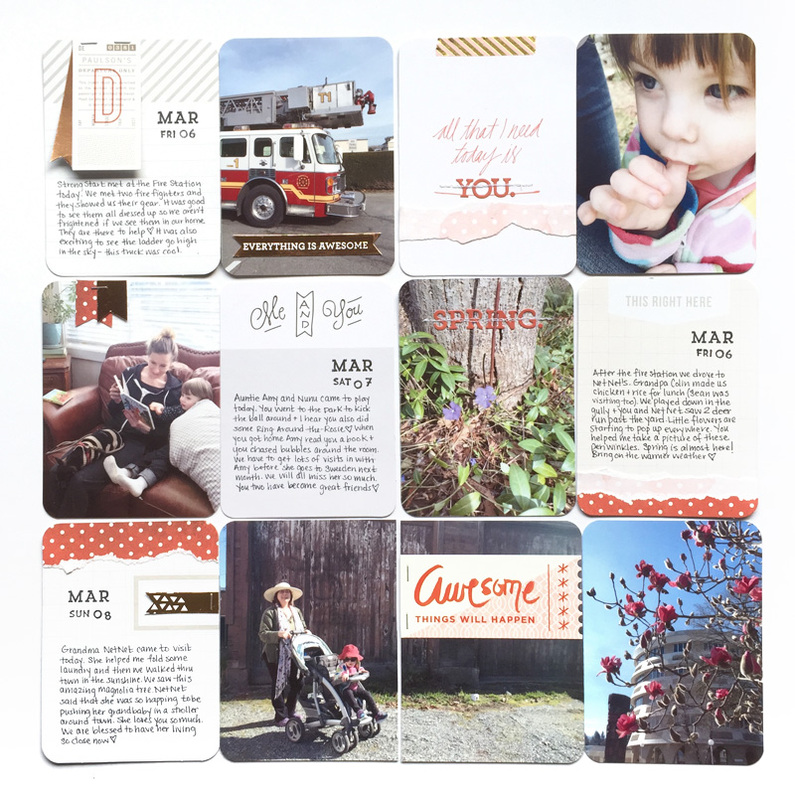 I hope you enjoyed taking a look at my week seven pages and I look forward to showing you more projects using Love Day Seed designs in the very near future! 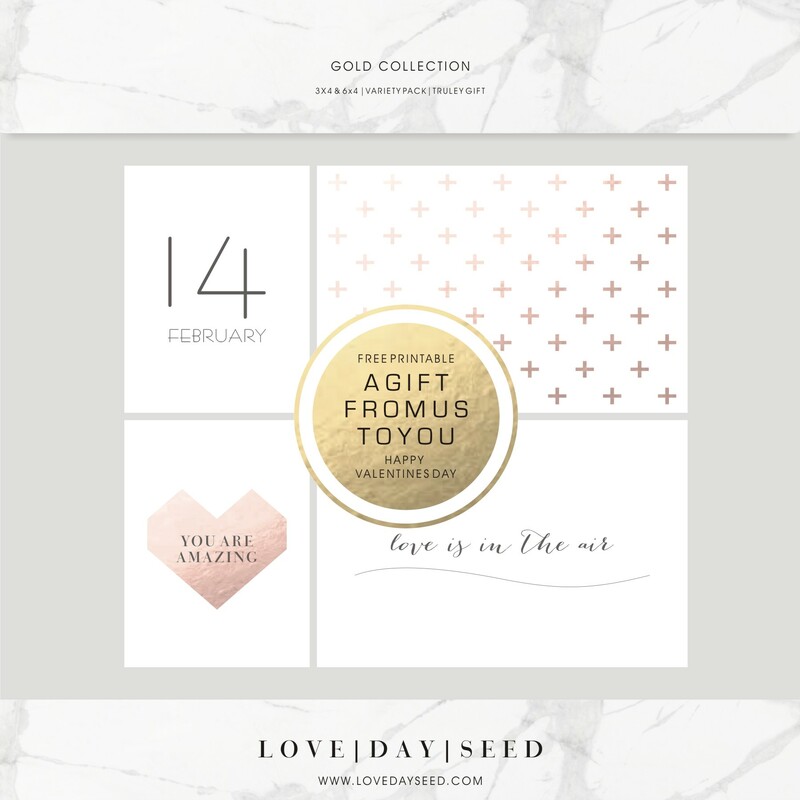 Visit the LOVE DAY SEED shop [gold collection > truly gift pack] to download yours today! 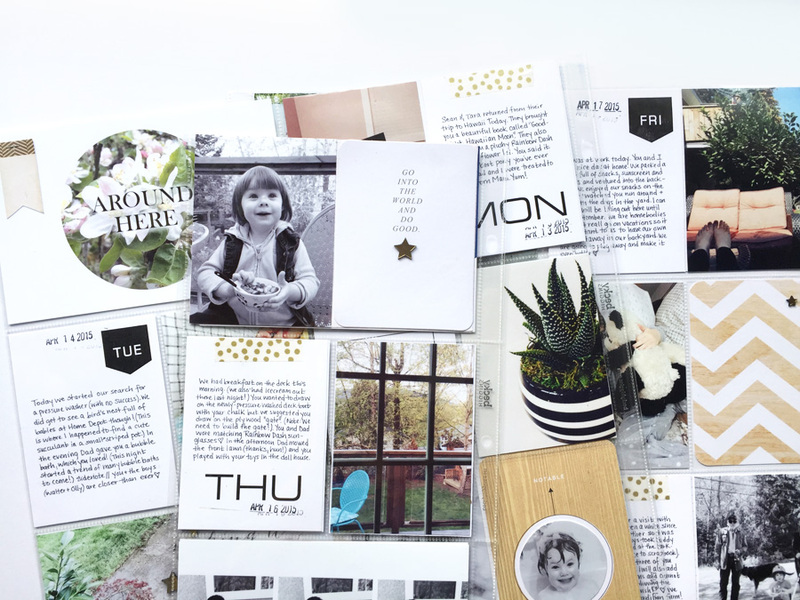 While you’re there be sure to check out the new release TRULY – which coordinates beautifully with this gift pack. Happy crafting! Hi Everyone! 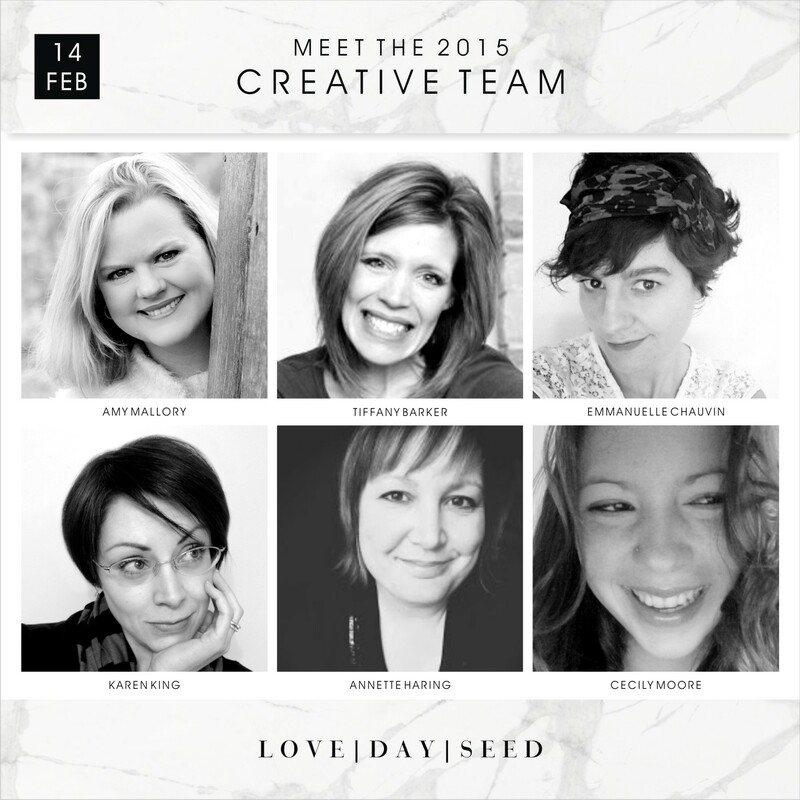 I am so pleased to announce that I am part of the LOVE DAY SEED 2015 Creative Team. 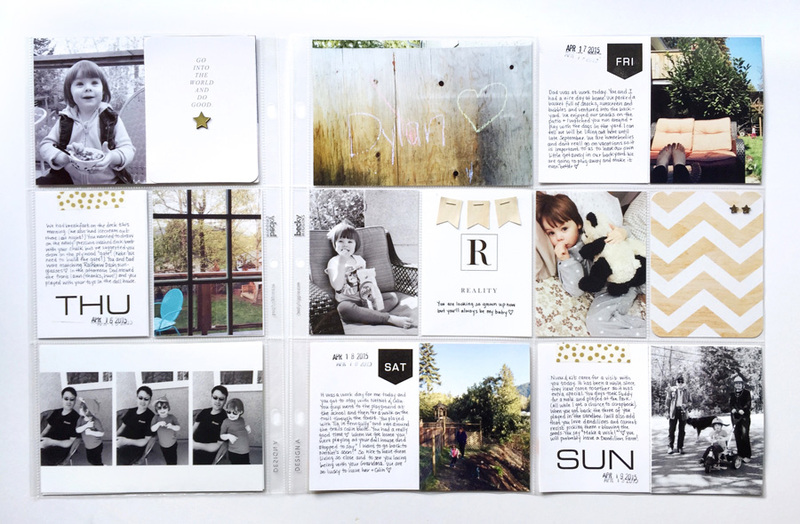 I am excited to share with you these beautifully designed pocket page cards. Be prepared to be wowed by the classy, minimalist designs for all the occasions you wish to document. I feel so lucky to work along side such a talented group of women. For further information and to visit the LOVE DAY SEED shop, please click through to www.lovedayseed.com. Please forgive my sparse blog. I was recently hacked and I am now it the process of moving everything over to this more secure wordpress hosted blog. Thanks for stopping by and I hope to see you soon! In the mean time, please check out my Instagram account (@karenkingdesign). Little Miss Elsa. She’s the shyest of the bunch and mostly just follows Phoebe and Ursula around. An Anna’s hummingbird in our backyard.